Cyclists in the City: Blackfriars Bridge. Yet another collision last month. This time, reported in the words of the cyclist who escaped being crushed by a truck. How far can you blame the infrastructure for what keeps happening here? Blackfriars Bridge. Yet another collision last month. This time, reported in the words of the cyclist who escaped being crushed by a truck. How far can you blame the infrastructure for what keeps happening here? right. Across one cycle lane and three motor vehicle lanes. Recipe for disaster? 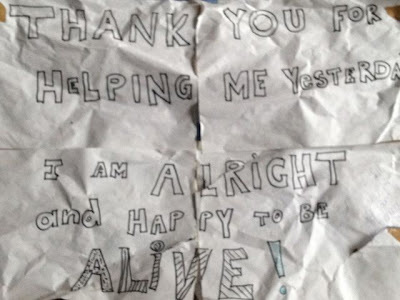 Two weeks ago, the Evening Standard ran a piece about a 'mystery mangled bicycle' left on BlackfriarsBridge with a thank you note to passers-by who helped after a collision. Ruth Anthony was on that bicycle and had been cycling straight over the Bridge when a truck turned left across her towards the Embankment. The collision took place at the north of the bridge, pictured above. As you can see, there is a busy 2.5m wide cycle lane used by thousands of cyclists every morning. The vehicles on the right of the bike lane are heading straight-on or turning left at the lights. The people in the bike lane are also going left, straight on, or trying to turn right by getting across the three lanes of motor traffic beside them. TfL has recently widened the bicycle lane here making it much clearer that this space is meant for cyclists. But it's still a hugely ambiguous layout. If this were Montreal or New York, there would be a great big sign telling motorists turning left to give way to cyclists carrying straight ahead. Pictured left, the sort of sign you see at junctions in New York City. Motor vehicles yield to people on bikes. Simple. To reinforce the point, in New York or Montreal, there would be a physical divider, protecting people on bikes and keeping motor vehicles away from them. There might (as pictured below) be separate traffic light phases for bikes to go straight ahead and cars hold on red. But this is the UK, not New York City. As far as I understand, the Department for Transport won't allow transport authorities like Transport for London to enforce a give-way to cyclists at a junction like Blackfriars. So what you end up with is a dangerous compromise. A semi-decent bike lane (if you're going straight ahead) where no-one has a clue who has priority and who doesn't. It's not abnormal to see 20-30 cyclists at each traffic light phase, all going straight ahead. And one or two motor vehicles turning left. The reality is that when the lights go green, the one or two drivers either edge their way or simply force their way through the 20-30 cyclists. Bike lane junction in New York. Basically, the rules of the road don't work at this junction. There's simply nothing in the Highway Code that tells drivers how to handle junctions with 2.5m wide bike lanes next to them. Meanwhile, cycle training would probably suggest you should 'take the lane' and slot in behind the motor vehicles. But that seems daft here. There are simply too many people on bikes and the queues of motor traffic in the left lane can stretch back quite some way. Ruth was run over at this junction by a motorist turning left across the bike lane. I contacted Ruth directly to ask how she was and to find out what really happened. Her story is below. I've tried not to pass comment on Ruth's story. What I've tried to do is to set Ruth's story in the context of how this junction really works (or fails to work) - a junction that is used by thousands of people who cycle through it every rush hour. I find this junction tricky to manoeuvre through and keep my eyes and ears on high alert and pedal like crazy to try get through the junction as safely, visibly and clearly as possible. I think everyone on a bike has a responsibility to look out for themselves and look out for others on the road. And I feel that cycle training is one of the most sensible things a regular cyclist can do. But the reality is that this is a junction (like almost all junctions in the UK) designed for motor vehicle flow, with half-baked solutions for people on bikes that introduce conflict between road users rather than design that conflict out, in the way that you might expect from teams of highly qualified road engineers. Part of the problem is the tools at the hands of those engineers (rather, the fact that the Department of Transport won't allow some simple solutions, such as priority for cyclists here), but a big part of them problem is that this junction is designed to maximise the flow of motor vehicles, not the safe flow of all its users - including the people on bikes who make up 36% of rush-hour traffic here. The result is that drivers don't have clear instructions on how to handle all the bikes around them. And cyclists don't have a consistent or clear way to cycle through the junction either. Recipe for yet more tragedy? I think so. "On Tuesday morning I set off on my usual daily commute from Kennington to Farringdon. It was pretty much business as usual, although I did notice that there was more traffic than usual, presumably due to the Olympics. On reaching the red traffic lights at the junction of Blackfriars Bridge and Victoria Embankment I stopped behind three or four cyclists in the cycle lane, waiting to go straight ahead. I was next to next to a truck as were the cyclists ahead of me. The truck was indicating left. As the lights changed to green the cyclists in front of me proceeded straight across the road. It seemed that the truck driver was letting the cyclists through before it turned. I thought that the truck had seen them and allowed them through, and therefore had also seen me, so I proceeded to cycle straight ahead. But then the truck started turning left into my path, so I also veered left with it to try to avoid a collision. Unfortunately I wasn’t quick enough because I then I felt a bump on the back wheel of my bike and immediately and instinctively just leapt/dived off my bicycle to my left as far as I could towards the kerb. It’s a bit of a blur and I have no idea how I managed to do it, but I did and thankfully cleared the danger zone as my bicycle was swept under the truck and crushed under the wheels of a 40 tonne lorry. The driver only stopped 20 or so metres down the road - he must have heard the tyres of my bicycle exploding and only then realised that there had been an accident. I was in shock but the full realisation of how bad it could have been came when I saw the expressions on the faces the people who had witnessed it - they looked completely aghast and could not believe that I was able get up and walk about. The driver of the truck stopped and came over and asked if I was all right. I said I thought he had seen me because of the other cyclists in front of me and he mumbled something like ‘yeah they went around me’. I am not sure whether he just didn’t care, or, like me, was in shock, but he wasn’t apologetic and we didn’t talk again other than to exchange details (actually I got his details, he didn’t ask for mine). A PCSO was on the scene within a minute or two and then a passing car with three CID policemen stopped to check I was ok before a PC on a motorbike arrived to take statements from the driver and I. A paramedic from an ambulance attending to a separate incident across the road came over to check on me but I decided I did not need further medical attention as I only had a bruised ankle and knee. The PC on the scene informed me that City of London policy is to separately investigate any incident within their borders involving HGV’s over 3.5tonnes and cyclists. This is to check whether or not the driver has had the correct level of training, is not working over allowed hours, etc. They arrived but didn’t need to speak to me so I left them to interview the lorry driver and proceed with their queries. The police advised that I keep my bicycle in case of any issues that might arise in any claim I might make, so I locked it to the railings on the bridge to collect it later on (which I have now done). I decided to write a thank-you note and attach it to my bike because in these situations one does not often get to know how the story ended, and for my part I was so grateful to everyone who stopped to help. I wanted to let them know that I really was OK."
Terrifying. Thank goodness Ruth is ok.
What a truly moving account and we are very pleased you are fine. The truck driver was plainly unaware a cyclist was there. Yes, one can argue that as a truck driver in London at that junction at that time there is an overwhelming possibility of a cyclists presence, but for whatever reason he couldn't see the cyclist. This is not a plug for our product, but a plug for sensors on HGVs that 'tell' drivers a cyclist is on their left, right, back, front. OK so a little plug, but we believe our technology will help to prevent such accidents. Sensors are part of a larger solution, road design change etc etc. I simply don't understand how you can turn across a cycle lane knowing there are cyclists there without looking or noticing you're running someone over. Even with segregation for cyclists it's concerning that something like that is present in a city that is capable of so much harm. I have suffered three incidents here in which in every case, I have been left-hooked by a taxi. Thankfully, just taxis, and amazaingly my bike wasn't damaged in any of the incidents, and I was only injured in the last one. Basically, I was swept off by glancing blows and in the last incident I must have fallen awkwardly because I did some injury to my shoulder which led to a trio of conditions which took firstly an Xray guided cortison injection, and then a triple keyhole op to relieve inflammation, repair a tendon and grind away bone callus on my shoulder blade. I have absolutely no doubt that the cabbies were at fault on each occasion (none of them stopped) because they were "amber gambling" the lights - figuring that staying behind me risked the light turning red before I was clear, so gunning past and cutting across. On the other hand, I have seen way too many occasions on which cyclists have continued straight on through the lights (at green) while a motor vehicle was trying to make a left turn. I always play safe now, and hang back to let the vehicle proceed. It is mainly self-preservation, but also, I like to think, courtesy - how else are vehicles supposed to make this turn when the bicycles coming up their inside are an almost continuous stream during peak periods? But I think you have identified that the fault here lies with the design, and perhaps with the DfT which has not provided appropriate guidance, either to highway engineers, or to road users through the Highway Code. On a road without cycle lanes, vehicles would certainly not be expected to continue in the middle/right lane until level with a junction and then do a handbrake turn across the inside lane - they would be signalled to move left some distance before the turn itself. As an example, bus lanes generally terminate ahead of a junction, precisely because other vehicles could not simply run parallel to the bus lane and then hook left like that. 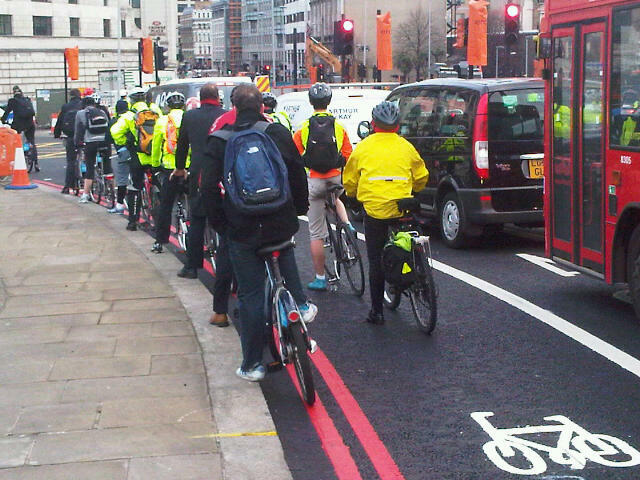 We would not want that for cycle lanes such as this, so what is the solution? One measure would certainly be an advance green to allow cyclists to get away before other vehicles conflict, but that doesn't resolve the situation throughout the rest of the green phase. That could perhaps be solved by having the cyclist light turn red earlier, just as it turns green, so left turners have a window to pass. Or somehow advice should be given that vehicles turning left across in front of you should have priority. I don't think that is an unreasonable ask - there just needs to be clarity about how the rules should work. I actually think people aren't aware of the cycle lanes. I took a friend on a training ride showing him a quiet direct route to work and cycle route stuff he can use. He actually said "I have never noticed this stuff before" It was like I had opened his eyes by riding along pointing out all the signs, cycle cut throughs etc. Please why was the cyclist waiting on the inside of a lorry indicating to turn left!? Either get ahead of it and away when light goes green or stay behind and wait for it to turn. 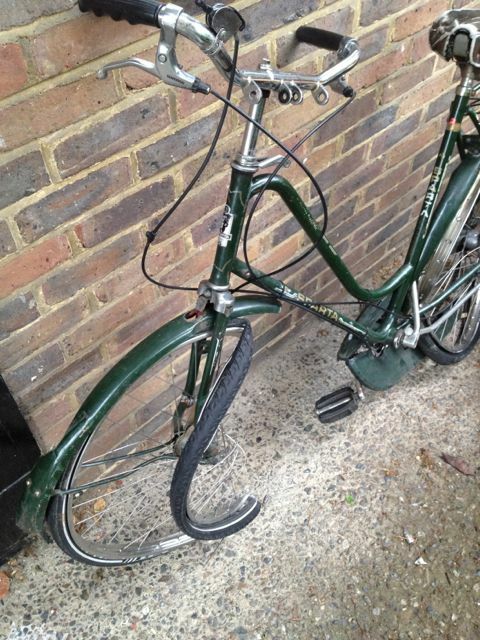 I don't think the easy rider dutch style bike is suited to London roads where a quick nimble getaway is needed. It is perfect for lovely car friendly Holland. Anyway glad rider is ok.
bike not suited? What about older, or younger, riders who 'arn't so nimble'. shouldn't the road, and cycle facilities, be suitable for everyone? The cyclist was waiting on the inside because that is where the cycle lane took them. As experienced riders we would "probably" not have put ourselves in that position but you can't be 100% sure. For example, what if you arrived at the junction before the truck? I believe the point is, that more can be done to make junctions like this safer because in practical use the danger has been designed in to it. "For example, what if you arrived at the junction before the truck?" Unless it snuck up on tiptoes and held it's breath i think i'd notice the truck regardless of who got there first. @Indie, the question was, "why was the cyclist waiting on the inside of a lorry indicating to turn left!?". The anonymous poster answers the question by suggesting they may have been there before the lorry, which is perfectly reasonable and happens all the time. Noticing the truck (or not) has nothing to do with it, but even if it did have, Jemma has been polite in explaining why you're still being unhelpful. With that volume of bikes, it's probably best to resolve the conflict before the junction. The Germans have developed a way of doing this - continue the cycle lane, but veer it away from the kerb, with a left turn lane starting "from nothing" at the kerb. This allows the left-turning motorist to cross the flow of bikes while they are spread out, rather than bunched at the lights. It does rely on the motorist respecting the continuity of the cycle lane, so it is wise to do this only in relatively low-speed-differential situations (preferably on a slight downhill, so bikes have a bit of momentum), and to make sure the cycle lane takes as straight a line as possible. Creating a separate light phase for bikes would also work (if there's enough room for separator islands), but would probably delay everybody. In California in this scenario, the turning vehicles would be expected to merge into the bike lane before turning. To indicate such, the last 100-200 feet of the bike lane has dotted line separating the bike lane from the regular traffic lane. But most CA drivers will simply wait in the regular traffic lane and wait until a gap in the cyclist occurs. I missed this question on my CA drivers test back in 1986 and never forgot it. When there are separate turn and straight lane for regular traffic, the bike lane moves between them similar to what Richard Mann describes. Glad you're OK. The driver's response that the "bikes went around him" is very vehicle-centric. It's sad to me that the UK is more like the US than continental Europe in this regard. Clearly, what's needed here is a protected lane for bikes, and a separate signal phase. A merging lane won't work well with these volumes of bike and motor traffic. Surely a vehicle that is crossing a line that marks a traffic lane is required to give way to traffic in that lane? I doubt the lane markings carry on across the junction. Whilst I accept your point about the design being a major contributory factor, all cyclists should know that the golden rule of navigating any big city is "Do not position yourself on the inside of large vehicles that may be turning left". So the cyclist in this incident, along with the road planners and the driver should also accept their fair share of the blame. Taking the lane doesn't mean waiting at the back of the traffic queue. You can take the lane 2/3 vehicles back from the stop line. The ASL and filter cycle lane is not a target. Fantastic that Ruth is OK, an incredibly lucky escape from an avoidable accident. I think that's beside the point. She could've been waiting in line behind the other cyclists first, and the truck may have rocked up by her side later. The point is the road is built to encourage conflict between all types of road users. I would normally say the same thing, but I know that junction well, and it's just not practical to avoid being on the left of whatever large vehicle is stopped there. Space is tight; there is no room to filter between the other lanes of traffic - you're more-or-less trapped in the (admittedly generous) cycle lane. There's no ASL (advanced stop line) for cyclists, and the traffic moving west onto Victoria Embankment before the lights change comes too close, so it's not possible to pull ahead of the stationary vehicles and move further to the right. There are usually lots of other cyclists using the lane, especially during rush hour, and consequently a certain amount of pressure, real or imagined, to keep moving and not hold people up. If I decided to stop several metres behind the line, I would expect a lot of passive-aggressive muttering as people pushed past me. Interestingly, there IS an ASL here - you might be confused by the fact that it's usually filled with motorbikes so it's hard for cyclists coming up the lane to pull out in front of motor traffic into a safe(r) space. Ah, my mistake! I haven't been in London for almost a year, and was trying to remember how that junction worked, and clearly got it wrong. I now have a vague memory of seething over motorbikes. Thanks. First, I'm glad Ruth is OK, and yes, she probably shouldn't have gambled on the driver having seen her, but really it is the design of the road that is at fault here. How stupid is it that a cyclist turning right is pushed on the left, when motorised vehicles have three lanes, and that vehicles have to cut through a stream of cyclists to turn left? If you design conflict in your layout, conflict will ensue, and people get killed. Second, what if TfL went balls out and said "screw it, the tools we have don't work and we'll import stuff proven to work from the Netherlands", what could the DfT do? Take them to court for insuring the safety of their users? Not only is it documented that Dutch-style infrastructure is the safest for cyclists/pedestrians while still allowing a reasonable flow of vehicles, but TfL could say they do not want to open themselves to corporate manslaughter charges like at Kings X. Between risking a criminal suit for manslaughter and an administrative slap on the wrist for not following regulations to the letter I know which one I'd choose. Sometimes you have to break the rules to make them better. I've often wondered this myself. The "rules" often mentioned in this context are usually from the "guidance" issued by the DfT. Admittedly, these are statutory instruments, so they do have the force of law, but what are the sanctions for breaking them? What can central government actually do to punish miscreant local authorities? And would they bother? I pass through that junction every morning and I'm keenly aware of this very risk, though my blood still ran cold reading Ruth's account! It can be misleading when a vehicle "lets" some bikes through but not others; I'll be doubly careful now. Thank you for highlighting this story. I would LOVE those "yield to bikes" signs in London! When driving I always check left before turning, especially if there's a cycle lane there. And when other cyclists get across ahead of me, despite a vehicle waiting to turn left I would usually think, "well they must be aware of us cyclists by now?". Maybe I'll be less hasty when cycling in the future. There are worse things than getting in the way of the "passive/aggressive" :) cyclists behind me. Glad Ruth is able to tell her story. To respond to the comments of the people above who are aghast that she positioned herself on the left of a left turning lorry - this is totally down to the road design. The bike lane at this point is a wide separate lane. It's not the same as squeezing yourself down the side of a lorry in a wide single lane, where there may be space but where there can be no fair expectation from a driver that there would be traffic on your inside. Here, it is a completely different lane that the drivers have to turn across. The design of the road creates a conflict. Totally agree. With a cycle that allows for the high volume of cycle commute traffic to clear before the motorised traffic is released. Perhaps cyclists should leave the optional bike lane before they get to the junction and join the appropriate right, left or straight on lanes along with the motorised traffic. As I did last time I used the junction. I didn't see a problem because I didn't use the cycle lane on the left when I wanted to go straight on. I don't use a lane on the left of a left turn lane to go straight on. That would be silly and lead to conflict. Kirst gets it, listen to her. Maybe a 20 mph zone and careful sharing of the road would be the best solution. The fact is that the left left of traffic is for those turning left or going straight ahead - it's not a left-only turn and many do go straight ahead so of no immediate danger to cyclists. Many of those turning left (taxis especially) don't bother to signal if turning left. I cycle through that junction every day and even if I wanted to it would be nigh on impossible and even more dangerous to try to squeeze through stationary traffic in a quest to get in a central or right lane position. A very good article, Danny. Echoing the thoughts of many, I am thankful that Ruth was not badly hurt, and am grateful to her for publishing her account of the incident. I think it's worth noting that this very near-miss would not even register as a slight injury in official statistics, and yet Ruth was probably an inch or two within losing her life. Unfortunately, not everyone is so lucky. Ruth's account immediately put me in mind of another similar incident which involved Rosie Wright, as related by her father, Peter: "It happened early in the morning when Rosie was on the way to work. She was riding down the Pentonville Road in London and at a place where all the traffic is forced to go left down the Pentonville Road - except for cyclists and buses, which are allowed to go straight ahead. She was on the inside. There was another cycle with her - a guy on a cycle - which cleared ahead of her and then I guess the lorry thought ... 'cause he saw one cycle clear ... the lorry turned left into her and ran her over." The problem is, of course, that cyclists are routinely being positioned in the wrong place relative to other road traffic. As you point out, correctly I think, this junction introduces conflict between road users rather than designs that conflict out. You make the point that signs might help, and they would, as Cameron Gray relates above. DfT-approved signs can be installed without the need for planning permission, even, and so, despite LCC's Cnut-like attitude towards them - "Practicalities at our end dictate that we will have to concentrate on implementing our existing and demanding workplan before being able to consider any other projects" - "The priority for change is safer junctions and streets, not signage" - there is an obvious benefit to employing them as a stopgap until something more substantive can be developed. Ideally, on roads such as this one, there would be segregated cycle facilities. Personally I take the view that two-way cycle tracks on one side of the road are much easier to get right than with-flow cycle lanes on both sides of the road, although as Paul Luton of Richmond Cycling Campaign observes: "Having the path on one side does require a continuous segregated system otherwise users can be dumped on the wrong side of the road." 92% of the cycle traffic at this particular junction either goes straight on or turns right towards the City (I think). A segregated two-way cycle track on the eastern side of the bridge would therefore be my preference. The space is clearly available. P.S. I am delighted to see Freewheeler has resumed blogging again, as I am sure we all are, but since his blog doesn't allow for comments, and knowing how closely he keeps his ear to the ground, I would like to point out to him here (if that's okay with you) that by the looks of that circular sign on the right-hand sign of this picture, the Ruckholt Road bridge is not in fact "shared use". Now, whatcha going do about it? I cycle this route everyday. Taking the lane is definitely possible. I doubt many cyclists would even consider moving out of the cycle lane though, unless they were turning right. And why would they? they are obv doing the right thing and using the infrastructure provided. add to this the amount of "advice" you would be likely to receive from other road users, especially if you were a slower rider. In Denmark, Switzerland, and I suspect many other countries the standard for a junction where there is substantial right (left for UK) turning motor traffic but a dominant straight ahead flow of cycle traffic, the right turning traffic is brought across to merge with or run to the right of the cycle lane. Back in the 1990's John Lawrence pioneered a right turn cycle lane on the offside in Southampton, backing his case by the observed fact that this was where the competent cyclists were riding. That junction at Blackfriars should have the cycle lane on the right side of the left turn lane, with the split and cross over set well back from the junction. One detail which is not yet in the current toolkit might be considered ; either on a small traffic island between the cycle lane and the motor traffic lane or several metres ahead of the merge point on the kerb there is a pole carrying a long vertical convex mirror (in the vertical plane only) and a warning triangle for both lanes of the merge ahead. The mirror provides a view back down the adjacent lane. The shallower angle of merging reduces the hazard from a close to square on side impact as the left turning vehicle rapidly presents a wide 'barrier' fully blocking the route ahead of the cyclist. It converts the danger of that hard left turn into something which can often be dealt with as a push to the side with escape delivered by a rapid application of the brakes, as the closing-in vehicle will continue to move forwards closing the gap slowly. There is a further very worrying detail at the North 'fork' in to Great Victoria Street. Right turning Northbound traffic have very little to stop drivers swinging a little further to the right and heading right of the traffic island in to the Southbound traffic from the City and likewise there is little but paint and a couple of No Entry roundels to physically 'wake -up' a dozy driver going through the gap and head-on in to the main flow of traffic Northbound from the bridge and Embankment. Even for the motor traffic there are dangerous compromises?
" Boris , the con artist " rides a bike ? NO , he uses a bike to try to CON the Cyclists of London he cares for them ! Fact is he is in the pocket of the " Motorists Lobby " since he needs the majority to become " PM "! Cyclists , daily leave their loved ones , uncertain of when or if they will return home ! Having ridden around London during the Olympic Period , i for one can say " BORIS you are a charlaton "! Bike Lanes are NOT FIT FOR PURPOSE ! To see Police vehicles daily driving with their LHS in or on the bike lane , says more than enough of drivers attitudes to Cyclists ! LONDON WAKE UP ! Cyclists mean that your traffic moves more freely ! EACH first Monday of the month , Cyclists should drive to their place of work wearing their lycra and with the bike on the roof . Whilst awaiting the lights to change they should step out of the vehicle so that the " Dreamy Motorist " becomes aware of WHY they are suddenly back in horrendous traffic difficulties ! How long would it take for the Media to start demanding that the Cyclists are given the Infrastructure to get them SAFELY to their destinations ?
" Cities fit for Living/Cycling " needs to be rammed home forcibly , with most " motorists/terrorists " ! Hoping to escape London with my life but feel deeply for those who ride because their life circumstances are such that they have no other option to balance their family budget ! I had a truck try to turn left through me in a bike lane. His mate in the passenger seat actually leaned out the window to tell me what they were going to do as they pulled up alongside me (we were moving not waiting) but did so too late for me to be able to brake and drop behind them before the turn. Fortunately the massive shouts of other cyclists as he started to turn made him stop leaving enough gap for me to get through otherwise it would have been a repeat of Ruth's escape manoeuvre. So don't think this is all about cyclists going up the inside or drivers being confused or caught out. Some of them do it clearly knowing what they are doing. The truck driver is responsible for this accident. He should have waited till there was a gap. He should be prosecuted and sentenced to the same penalty he would have received had he killed Ruth. Only when dangerous drivers are given a penalty which reflects the potential as well as the actual consequences of their actions will their behaviour change. That said, Transport For London should also be prosecuted for their negligence in not making the junction safer. That could easily be done by adding a bicycle phase to the lights. Yes it would slow traffic. So what? That is far better than what happened or Ruth or anyone else getting killed. Until the balance of power on the roads changes these problems are not going to go away. There is something about the road layout and the patient queue of cyclists waiting at the junction that reminds me of lambs entering an abattoir. I don't know why cyclists put themselves in any position of risk or make any assumptions that either a lorry or a car has seen them at a junction like this. You simply have to hang back or join the car lane and go with the traffic. The golden rule in London for cycling is not to trust anyone or ever assume they have seen you and if in doubt always hang back and wait for them to make their move. I cycle every day in London and every day i see the same manouvres from people that could so easily lead to a nasty accident. I agree that bike lanes are inadequate and in many cases put the cyclist in a dangerous position, and for this reason I would always queue with the cars in their lane or get the the very front of the first car and get off the lights as soon as they go green in order to avoid any doubt where i am heading. On the one hand, car usage in the central London area is down and bicycle usage in the central London area is up. On the other hand, pedestrian fatalities have increased by a third and cyclist fatalities have increased by 60%. Huh? One would think the more cyclists there are, the fewer cars there are, the better the quality of the alternatives, the lower the risk associated with cycling. But it's not working out that way. Could it be that the simple expedient of trying to squeeze as many vehicles through a junction as possible is actually resulting in more pedestrians and cyclists being killed? Horrible story, and very pleased she's OK. BUT, it's really simple. Don't cycle up beside large vehicles at junctions. You are always putting yourself at risk as a cyclist. I do wish people would stop laying the responsibility on the cyclists for going alongside trucks - it's a gross generalisation, and really not quite so simple in reality. Often the cyclist is first to the junction and the truck or other vehicle pulls up along side them. What are they supposed to do then? if you first to a junction, and going straight on, take up position in the middle of the lane, so that no left turning vehicles can end up on your right. If you are first at the junction, then a truck or bus arrives, get in a position where he can see you. If the truck/bus is already there, don't go up the inside. Wait. I don't understand how difficult it can be. And yes I am both a car driver and a regular central London cyclist. It was a rhetorical question you muppets and even then you still had to respond by getting on your soapbox and telling everyone how somebody as 'clever' as you would have reacted - talk about missing-the-f**king-point. The correct answer to the question 'what should the cyclist do?' is that you build your infrastructure so that NO cyclist (think about their being one of your children perhaps) ever has to deals with finding themselves in that blind spot for whatever reason. They manage to do it elsewhere - we should be pushing our representatives in parliament to re-discover their backbones and get it sorted over here! This is the difference between the UK approach and the Dutch approach. The Dutch approach is that EVERYBODY cycles and that EVERYBODY is capable of making mistakes. They therefore design their roads as much as possible with the assumption that people aren't perfect, so that mistakes won't end in death and injury. Here we just try to make everybody cycle in some theoretical "perfect" way, even though it's impossible to make that happen. If we actually manage to get children and the elderly cycling then it's even LESS likely that everybody will happily take primary in front of an HGV for christ's sake. Most people simply will NOT ever do this!! We need to redesign our streets so that inexperience and mistakes, or simple a momentary lack of attention, don't end up in a sad death. What a depressing load of comments. So sad that so many cyclists want to blame other cyclists for "putting themselves in danger/the wrong part of the road" rather than understand the underlying problems. I can't see much prospect of safer roads for cyclists or mass cycling in the UK while these attitudes amongst cyclists themselves persist. We need a united front to push government to build roads fit for everybody to cycle on. PLEASE STOP BLAMING THE VICTIMS! Indeed. But it's always easier to point the finger at someone else rather than face up to our own mistakes. I note that the junction where Dan Harris was killed recently was originally part of LCN Route 8, then it was part of LCN+ Route 250, could be part of a revitalised LCN Route G7, but is currently part of nothing. From my point of view the frustrating thing is that this is what LCC have asked for, in a roundabout way, I mean. "Unless it's perfect, we'd rather have nothing, thank you very much." Dom Nozzi has said, "In part, public planning agencies have no vision because they are drowning in minutiae." This is precisely LCC's problem. We do need a united front. As Dave Horton says: "So for me, actually, it’s the visions and ambitions, and getting the maximum number of people possible to share those visions and ambitions, and to discuss them." Blaming the victims? What good is it being a victim? People need to start looking out for themselves. Some of the cycling I witness everyday is terrible. Through red lights (with people crossing), out of side junctions without stopping, up the inside of moving buses... And then I read articles about how everyone else should stop/ wait/ look/ redesign the entire road system. It's dead simple. Stop going up the inside of huge moving vehicles. I ride a motorbike and guess what? I have to slow down and be prepared whenever there is a car at a side junction, watch for pedestrians and cyclists rushing through traffic without looking and generally be very aware of everyone else. You've got your cycle lanes, you've got you superhighways, you've got a listening ear in just about every level of democracy. Now I'm suggesting you (as a group) start looking after yourselves and stop being prats. PS - your defensive positioning just puts you closer to motorcycles and when turning left at a junction, you might want to try positioning yourself to the left, rather than sitting on the right hand side of the box and expecting everyone not to run you over when you yank across as the lights change. And I've lost count of the number of cyclists who want to sit in my blind spot and force their way through gaps. It's a blind spot! There's a queue. Sort yourselves out before they start making you all get licenses. I was almost crushed under an articulated fairground lorry who was cutting a left hand corner on a fairly wide clear road some years ago, I was able to take urgent evasive action because I saw what was happening in my bicycle mirror, If I`d had no mirror, it would have been NO Bike...No Me ! In my opinion bicycle mirrors are a life saving essential. 1. In the UK there is NO cycle lane compulsion- if it's there you don't have to be in it. 2. Cyclists turning right and going straight should NOT rigidly stick to the left of the lane. It's dangerous and and adds to the overall confusion here. The amount of times I've come close to conflict when trying to turn left but find my way blocked by folk travelling in a different direction. 3. Cyclists: There is no shame in looking over the shoulder of the direction that you're planning on occupying. Cycle training will empower you to make the common sense decisions that will keep you out of harms way and not ride with your head down following the lemming pack. I agree with David - what a depressing set of comments here. More training will NOT work - it has not worked over the last 35 years. More safety equipment will NOT work - it results in a safety arms race and puts people off cycling. More assertive riding will NOT work - is my granny or niece really expected to dominate the lane in front of a heavy truck? The ONLY thing which is PROVEN to work is PROPER INFRASTRUCTURE. Please, go to Holland. It will cost you £40 each way on Eurostar to any Dutch station. Hire a bike for £5 per day. See how it could work here. It's not perfect over there, far from it, but it's a million times better than what we have here.